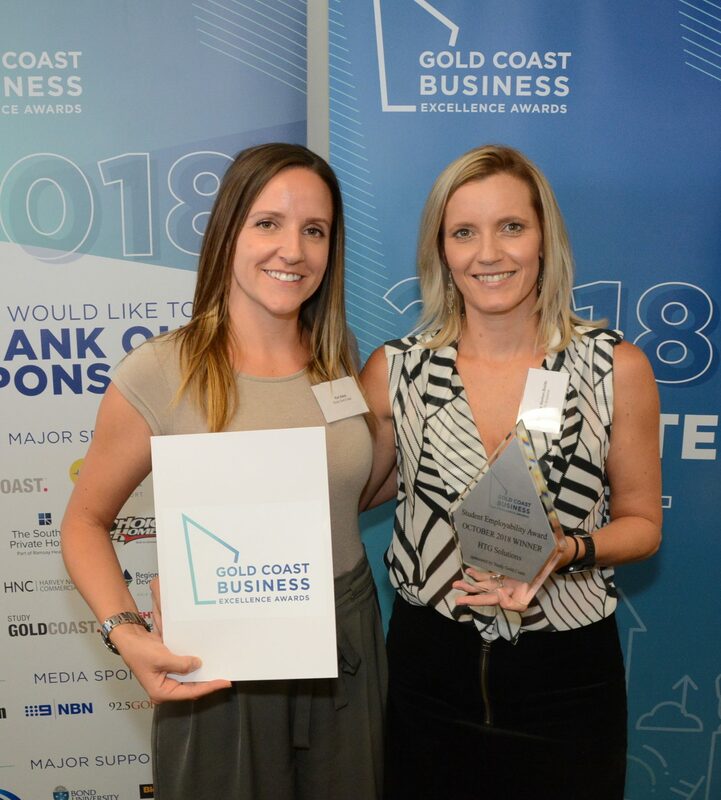 On Wednesday 24th October 2018, HTG Solutions were awarded the prestigious Gold Coast Business Excellence Award for our Student Employability program. 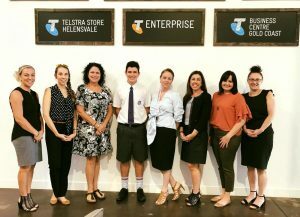 Working with many Gold Coast education providers, HTG continues to provide students with unique workplace initiatives and experiences. Partnering with great institutions like Bond University, Griffith University, Gold Coast Coomera Tafe and schools across the Gold Coast, HTG’s goal is to create meaningful training and development programs that motivate, inspire and challenge people to be the best they can be. HTG created a program with Bond University called ‘In Pursuit of Brilliance’ where the Career Development Centre aligned our initiative with Baden U’Ren’s Bond Entrepreneurship and Innovation and Business Accelerator – incubator subjects. Almost annually, students have been encouraged to apply to kick-start their business venture with a $5,000 grant and 10 week intern program at HTG. From submitting a business plan on a page and then pitching their ideas, students have a ‘shark tank’ experience with HTG’s senior leadership team, where one winner is awarded. With many students sharing their ideas throughout the years, one notable winner of the HTG ‘In Pursuit of Brilliance’ award was Alisha Geary, who founded the brand Faebella. Faebella is active wear featuring Aboriginal and Torres Strait Island designs and Alisha used the $5,000 to purchase stock to help build her online business. Since then, Alisha has been successful in the Pitch@Palace Australia start-up competition and was crowned a winner by HRH Prince Andrew, The Duke of York at Government House in Sydney. We were so pleased to be part of the initial start-up. 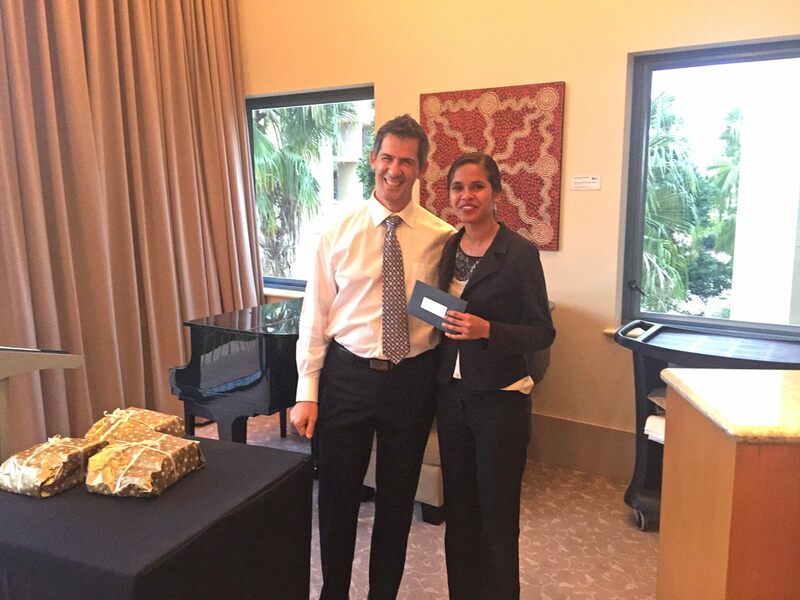 (Alisha Geary with Director Tim Tocco, after winning the HTG & Bond University ‘In Pursuit of Brilliance’ program). Further to this there was another program of work, which was developed with Karen Graham, Work Integrated Learning Project Officer at Coomera TAFE campus. A brief was created for the graphic design students at TAFE asking them to build a recruitment campaign for HTG. Nineteen graphic design students were given four weeks from the initial brief to come up with their own individual creative thoughts and designs and were given the opportunity to pitch their ideas directly to a panel at our HTG headquarters. We were pleased to award two winners with two quite different designs, which will be integrated into HTG’s recruitment campaign for the 2018/2019 financial year. We have been able to provide a number of students with a taste of how and what is expected from the beginnings of a client brief to the benefits of pitching. Our goal is that the students will utilise this experience in their future careers as graphic designers. HTG also offers internships and work experience opportunities with school and university students throughout the Gold Coast. A marketing internship opportunity with Griffith University saw Rowan Johnstone who was studying a Bachelor of Business and Marketing, work within the HTG marketing team mentored by Zoe Shearer, Group Marketing Manager primarily on digital and content marketing. 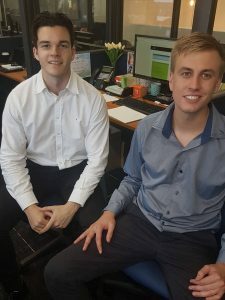 Following Rowan’s internship with HTG he applied for a role and was successful as they were impressed by the experience and knowledge made him work-ready with a new digital marketing role on the Gold Coast. This year we have also seen our first school based traineeship program with Aquinas College. Year 10 student, Henry Young, is currently working through a 250 hour traineeship with HTG which will eventually certify him with a Certificate 3 in Business, at the age of 15. We are currently working through a number of potential projects with Study Gold Coast who are assisting us to find the right education facility to help us bring more opportunities for young students to build and develop their skills while continuing to add a breath of fresh air to HTG and assist us to continue to grow our business. This is based on the success of opportunities mentioned in this and knowing how valuable it is to offer students from any education facility be it University, secondary school or TAFE the opportunity to work and grow with us. We are delighted to be part of building skills for young people who can become the next generation of leaders driving the Gold Coast economy.